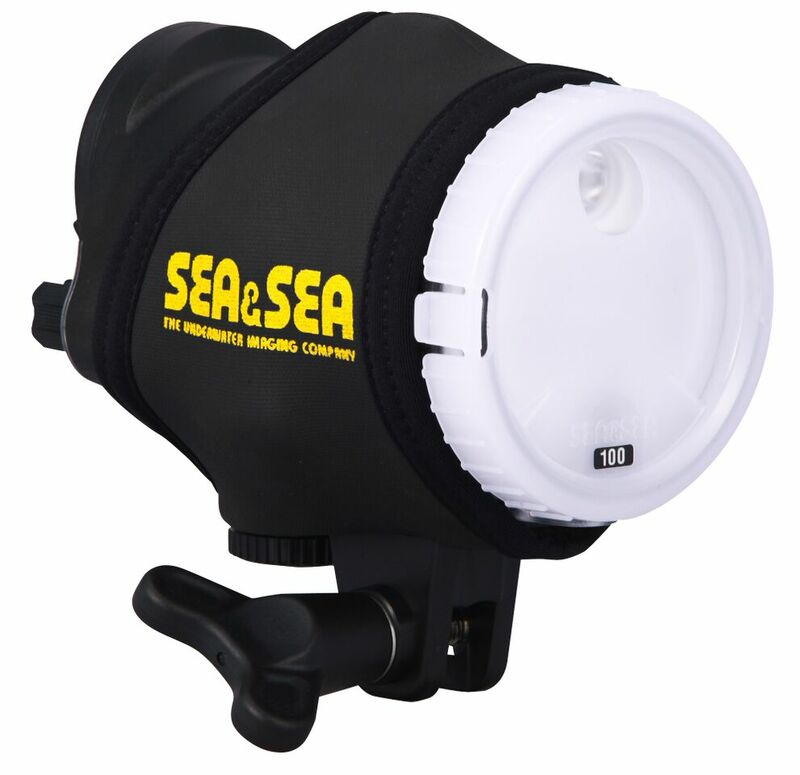 SEA&SEA has announced a new strobe that will replace the extremely popular YS-D1: the YS-D2 strobe. The new Sea and Sea YS-D2 strobe will look very similar to the YS-D1, at least until you take a closer look at the new features. If you're not familiar with these strobes, be sure to check out our YS-D1 strobe review. The new SEA&SEA YS-D2 strobe has really upped the ante. The most obvious improvement is the faster recycle time: .4 seconds faster than the YS-D1. When using Ni-MH batteries (like Sanyo Eneloops) the new YS-D2 will recycle in 1.4 seconds, while the YS-D1 recycles in 1.9 seconds. This faster recycle time enables you to shoot more exposures during fast action and provides a nice reason for divers with the YS-D1 to look towards an upgrade to the new strobes. Almost everyone who uses the YS-D1 will nod their head in understanding when you mention that you accidentally bumped the strobe setting knob when repositioning the strobe. 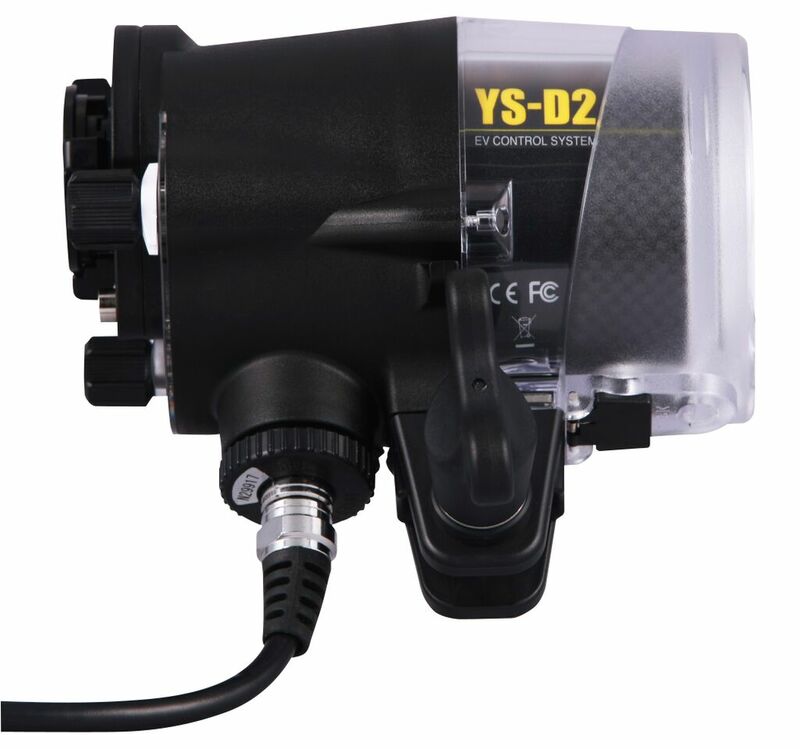 The YS-D2 addresses this with new knobs that require two fingers to turn - they won't be moved by an errant finger when you grab the strobe head to position it. The power dial also has new markings, showing strobe power as stops of light. 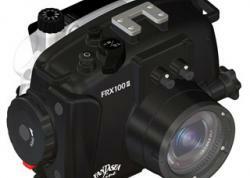 The graphic is easier to see and read for both TTL and manual shooting. 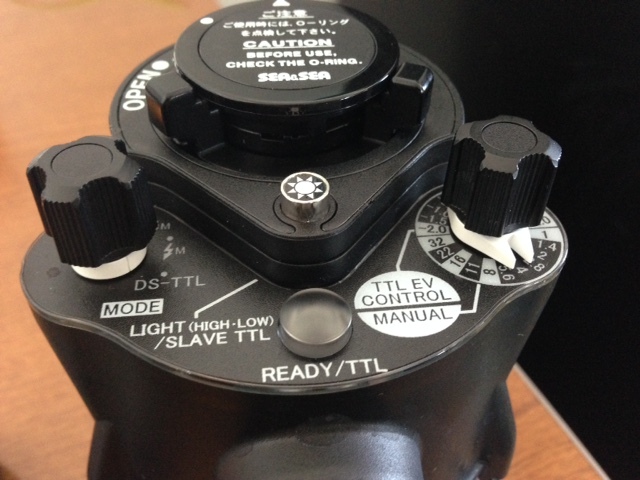 The photo below shows the new dials as seen on a demo strobe that arrived at Bluewater Photo today. The target (aka modeling) light on the YS-D2 is a nice feature. 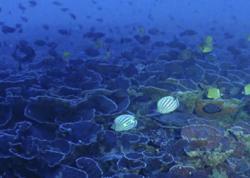 I use the target lights on my D1s as backup lights on night dives - double redundancy without carrying anything extra. Divers using two strobes will generally not use the target light (and new red filter) to aid focus, since the strobes are generally not pointed directly at the subject. 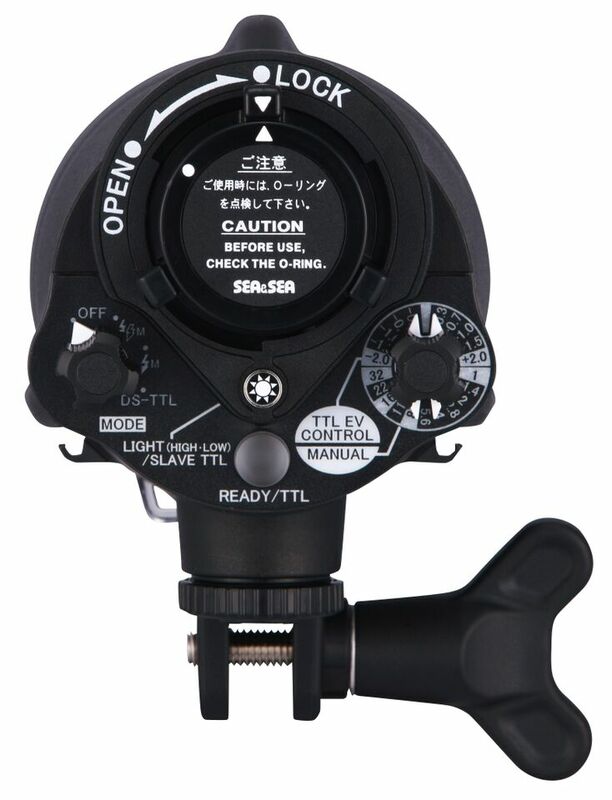 The target light will be useful, however, for divers shooting macro with a single strobe, when the strobe head will be pointed directly at the subject. 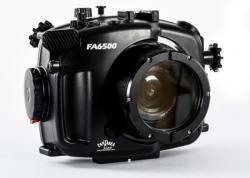 Learn more about underwater strobe positioning. Like the YS-D1, the YS-D2 has an LED indicator light on the back panel that let's you know once the strobe has recycled, the shooting mode and when power is low. 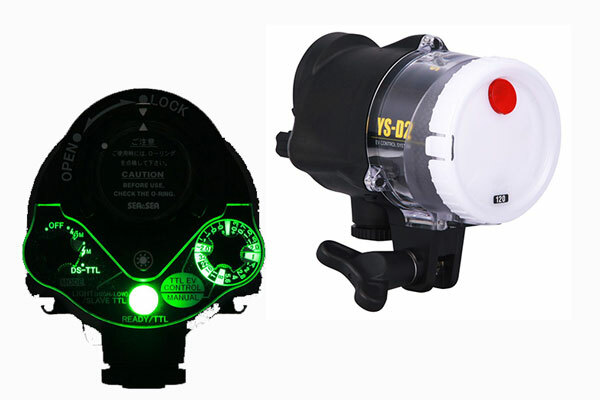 The YS-D2 strobe also includes this light, however the labels for shooting mode and power level now glow from this light so that you can see them at night. This is a very cool idea for those who don't know how to operate the strobe by feel alone. Plus, it looks pretty futuristic! 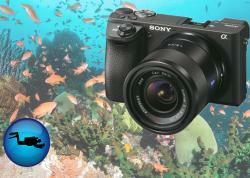 The largest weakness with underwater photography gear is a flood. The YS-D2 battery compartment is redesigned and should be able to withstand an accidental flood. 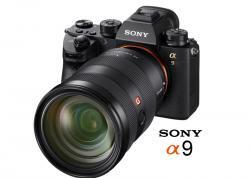 Simply clean it out and replace the back battery cap (with a new one) and you're ready to keep shooting. Make sure to carry a spare battery cap on your next trip. 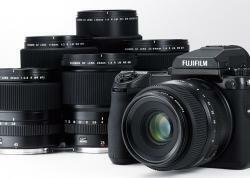 The YS-D2 will be availably starting July 15, 2015. 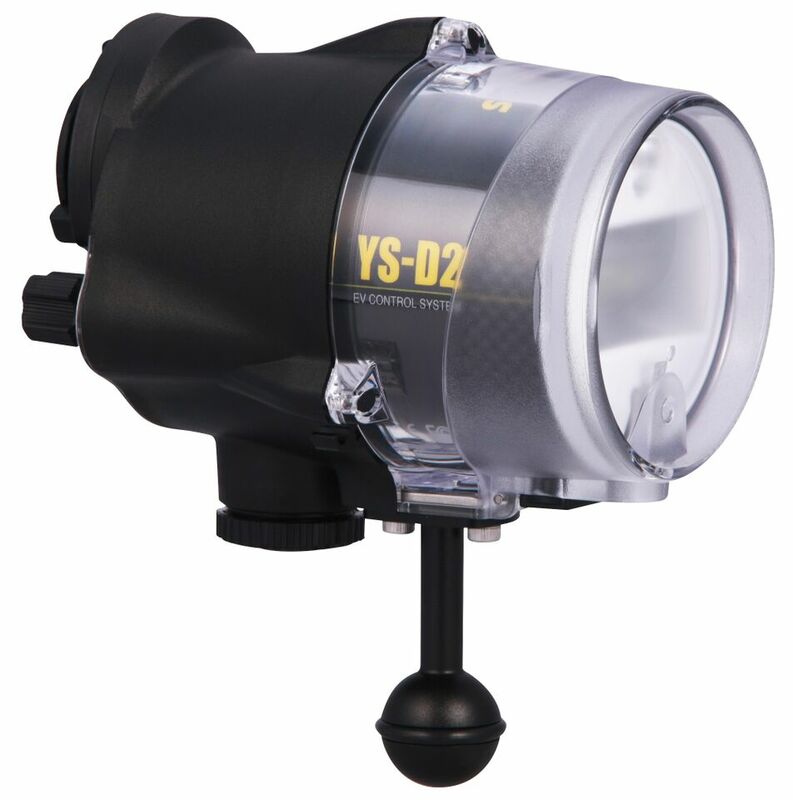 Purchase the YS-D2 Strobe at Bluewater Photo.